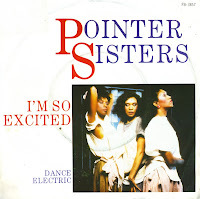 The Pointer Sisters originally released 'I'm so excited' on their 1982 album 'So excited!'. The track was remixed for a single release in 1984. It reached number 9 in the US Billboard Hot 100 chart, number 18 in the Dutch Top 40 and number 11 in the UK singles chart. In the music video, the sisters acted as if they were getting ready for a night out. Anita is shown dressing up and putting on makeup, Ruth in a nightgown seductively and playfully getting dressed on her bed, and June taking a bubble bath. The video created a minor controversy in America because of a shot where June gets out of the tub. Although the towel she has is covering her stomach, it doesn't prevent June from showing a little 'too much' of her lower body. The shot was edited in slow-motion for later broadcasts.